Since the Project Eternity Kickstarter campaign ended last October, Obsidian Entertainment has been flooding backers’ inboxes with information. In another attempt to give fans an inside look at the game, project director Josh Sawyer sat down with RPG Codex to answer a few questions. Casting a spell, or any deliberate action will drastically increase this radius, but that doesn’t mean enemies will be alerted. Merely “bumping” an enemy’s radius will cause them to investigate, giving players a chance to flee. Of course, this will turn into an all out attack if a character doesn’t react quickly enough. Stats will function differently than the usual Dungeons and Dragons affair as well. For simplicity’s sake, one statistic will affect things like weapon damage or accuracy, as opposed to different weapons requiring different stats. While this might diminish the satisfaction of crafting the perfect character, it does make each individual that much more versatile. Also on the topic of stats, crafting will be less fruitful than one might think. Every recipe found will only be used to “create consumables or to add/upgrade properties on existing items.” Special weapons and armor will not be available to craft, however they will be available through drops, quest lines, etc. 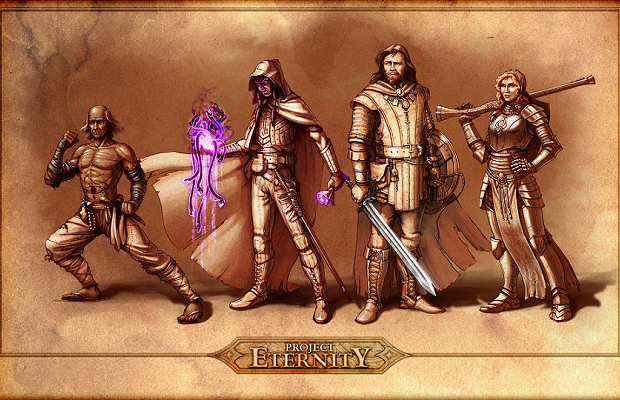 Project Eternity can still be backed on the official site, and is scheduled to release in Q2 2014.